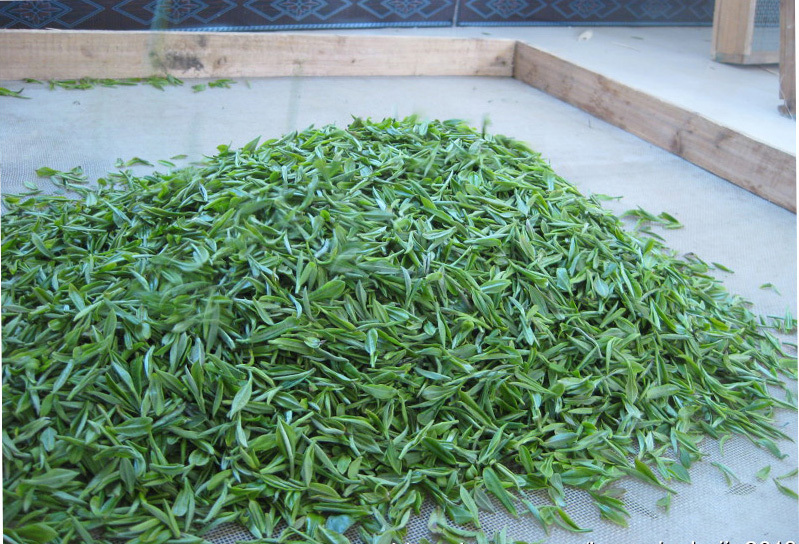 (苏轼) has ever praised the tea producing in Xin Yang as Number One of South Huai River (淮南茶信阳第一). 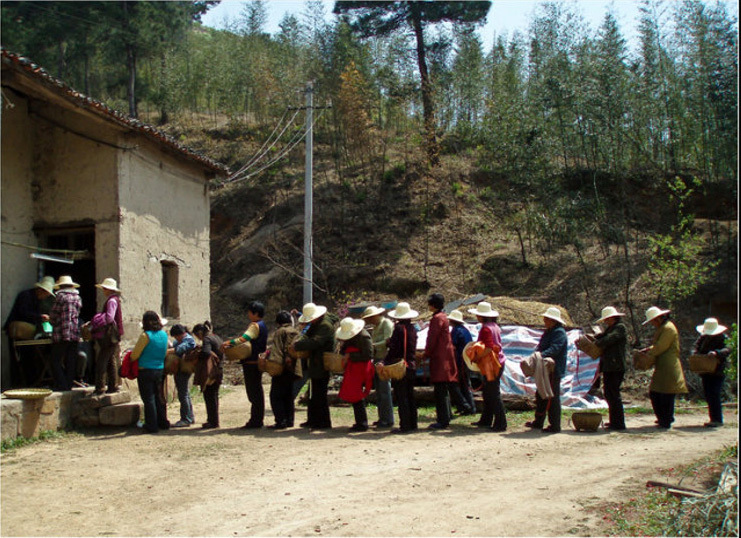 Xin Yang is a mountainous region, the mountains are cloudy in most of the time in the year. 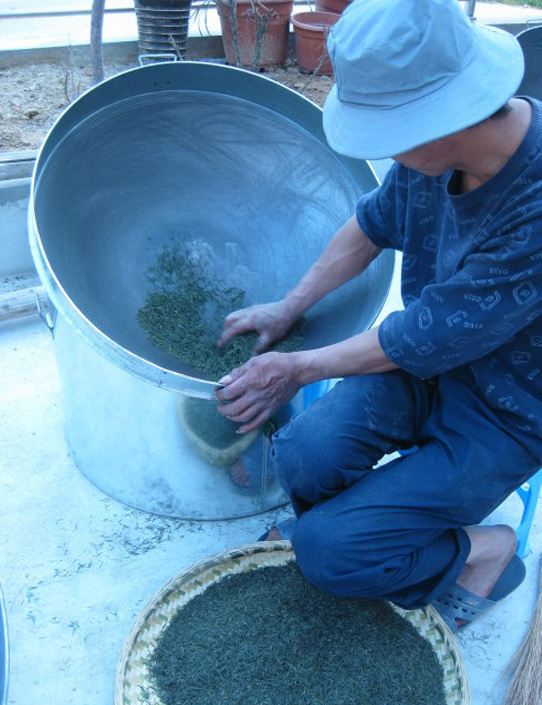 the soil there is sandy and rocky which supply rich minerals for tea growth. And also it has dense forestry covering in this terrain. 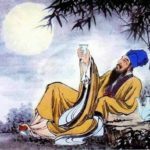 It is an ideal place for good quality tea. 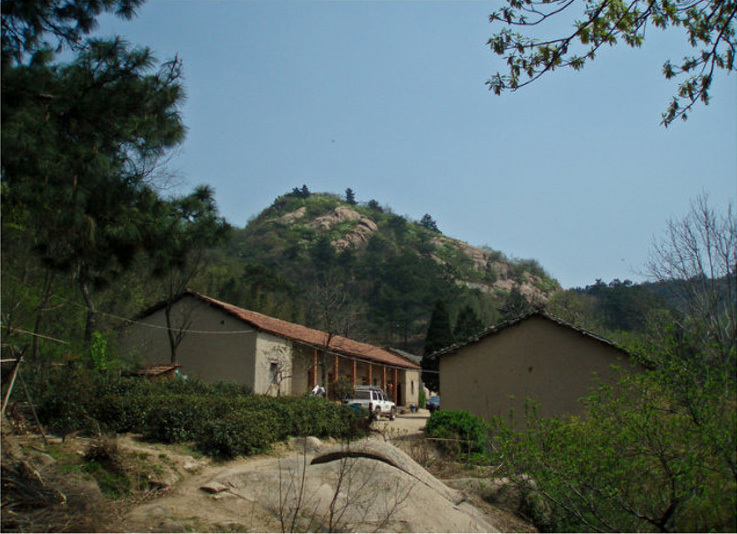 The outstanding producing sites including five cloudy mountains, Cheyun, Jiyun, Yunwu, Tianyun, Lianyun, two lakes, Black Dragon Lake and White Dragon Lake, one mountain, Zhenlei Shan, One village, Hejiazhai and one temple, Lingshan Temple. 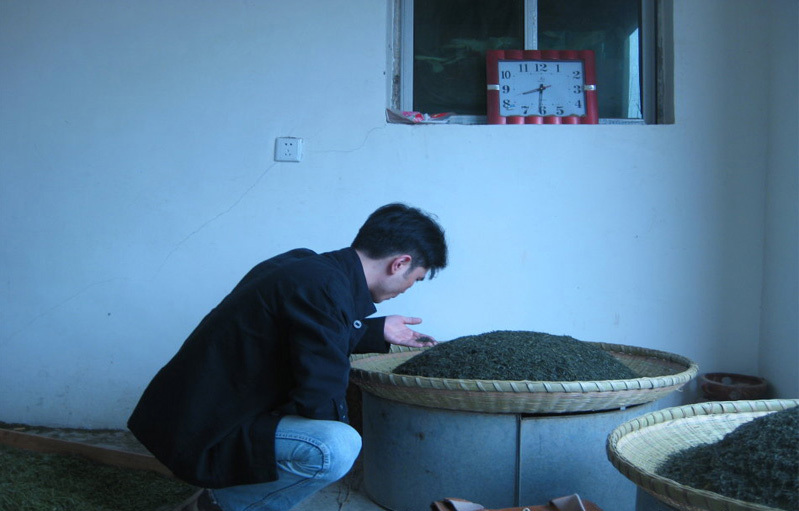 The diligent and clever people there use traditional and innovative processing to make the tea with appealing appearance, fruity flavor and fantastic mellow taste. 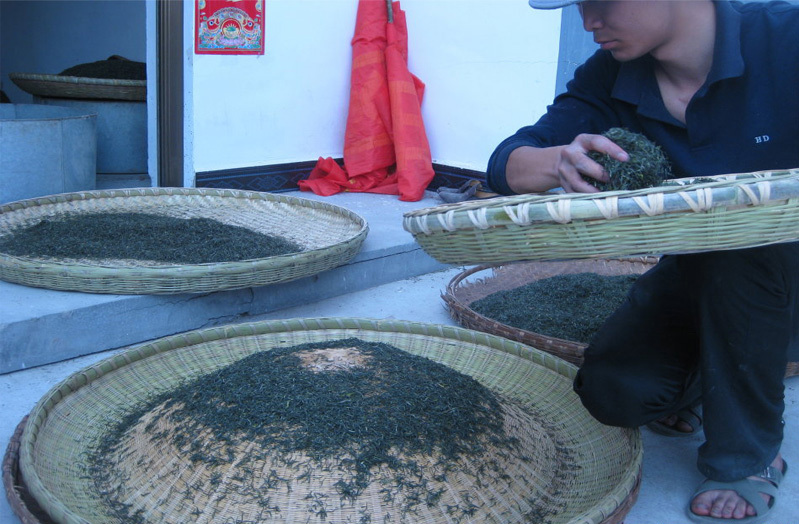 Xin Yang City,one of the far North Chinese tea growing region. 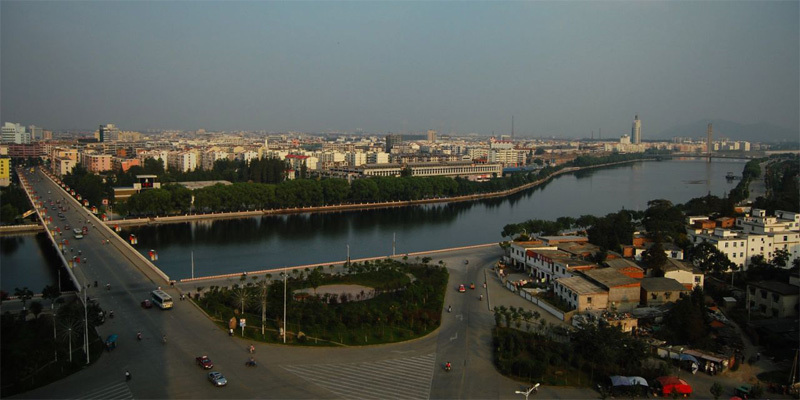 It is in the south of Henan Provicne. 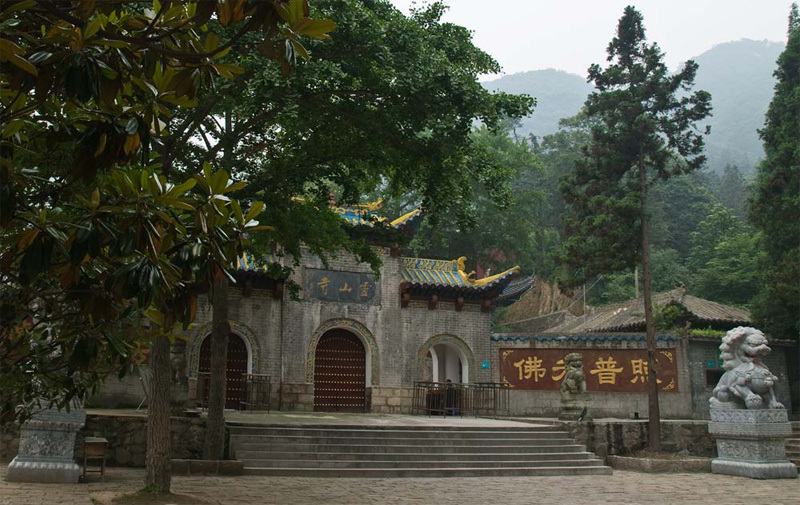 Lingshan Temple, the earliest place in Xin Yang to produce Xin Yang Mao Jian. Tea pluckers, most of them are women, waiting in turn to weight the daily plucked tea to get their salary. 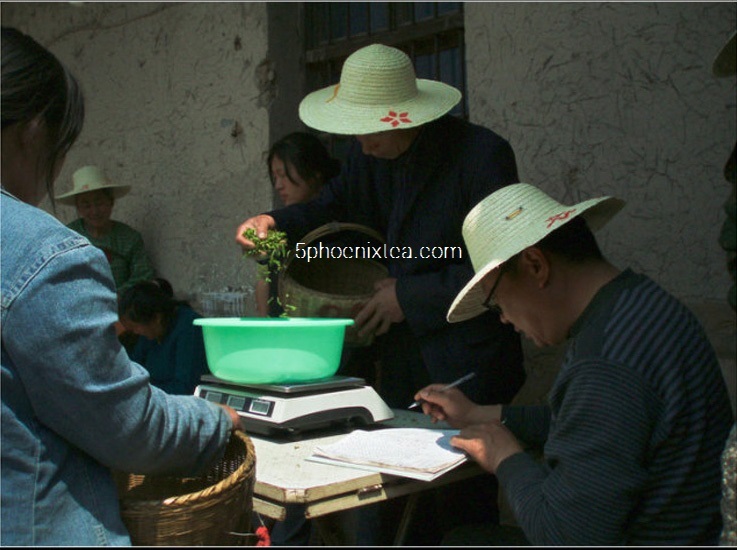 The collectors are carefully weighting and checking. 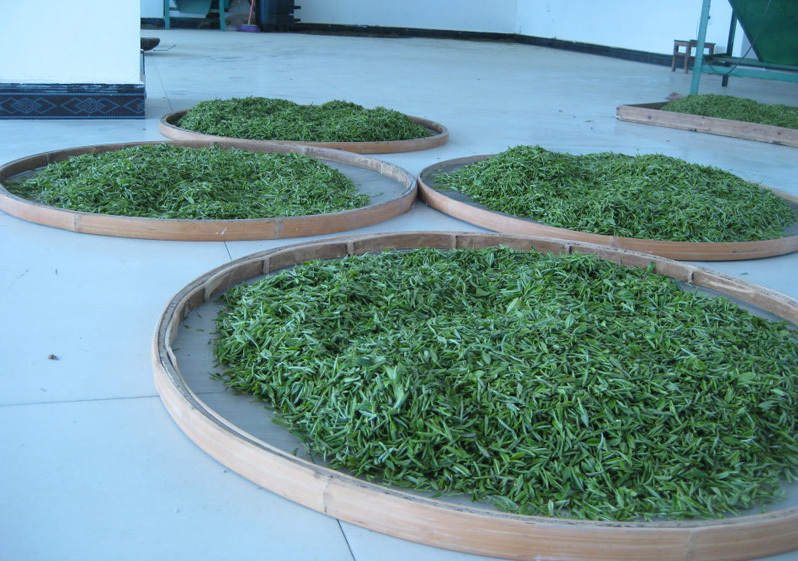 Some of the tea pluckers are conducting re-sorting to meet the collecting standard. 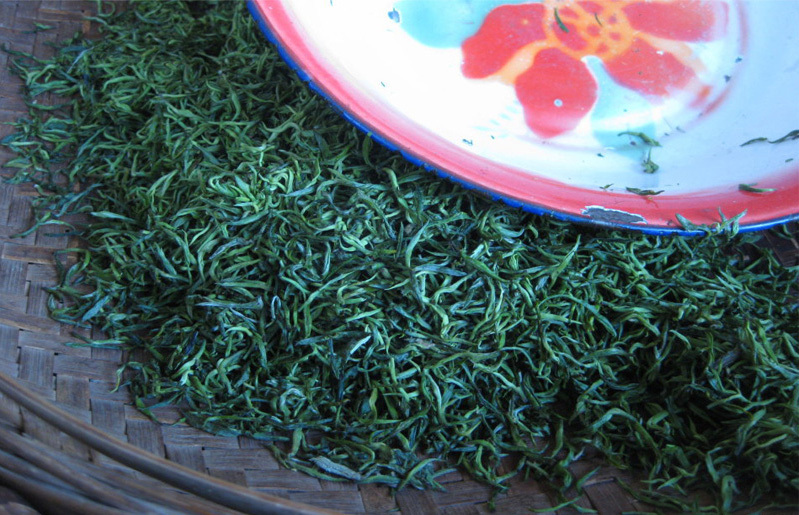 Fresh leaves withering in the bamboo plate on the ground. These are leaves got properly withered. 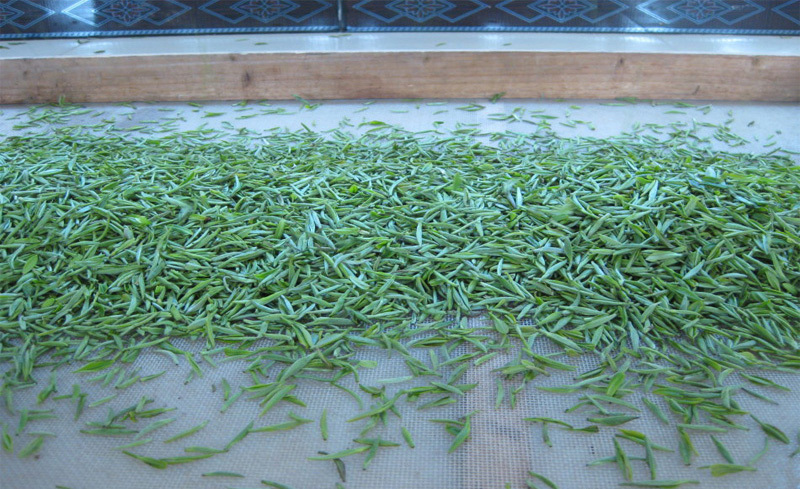 The withered leaves need grade sorting before frying, meanwhile in this processing the leaves got a bit shaking and colliding. 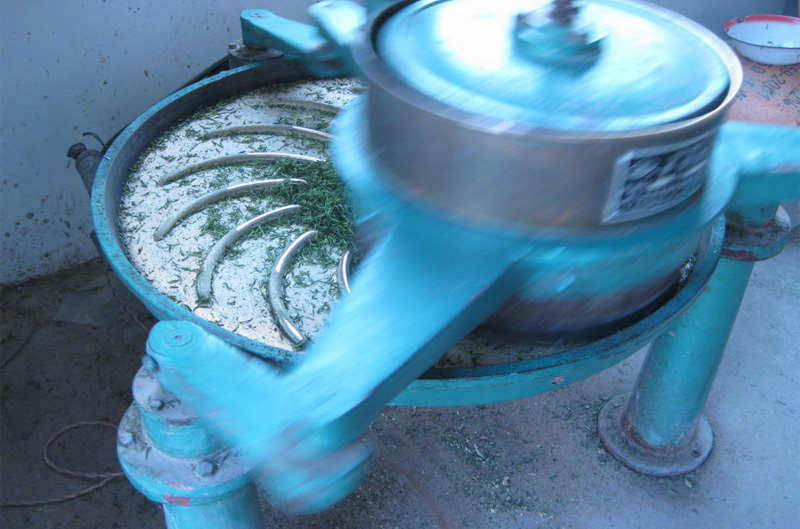 The fried leaves were launched away the drum. Quality control. 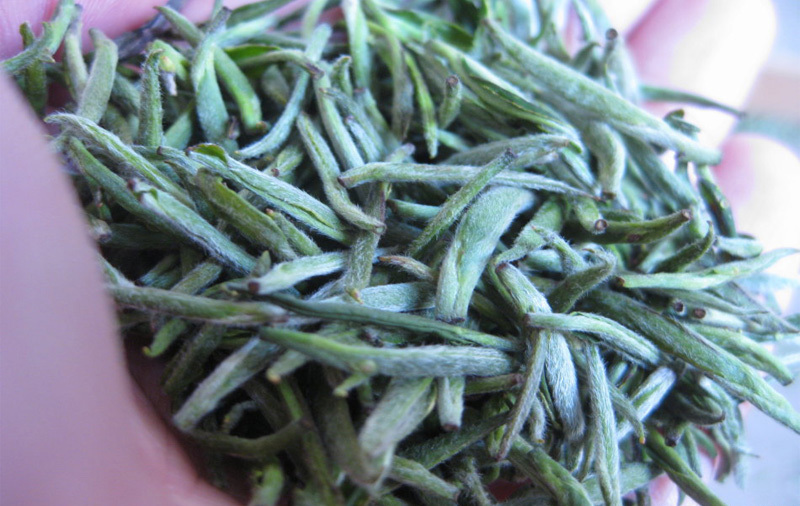 Properly fried tea gives off pleasant flavor, grassy flavor and burning flavor can not be allowed. 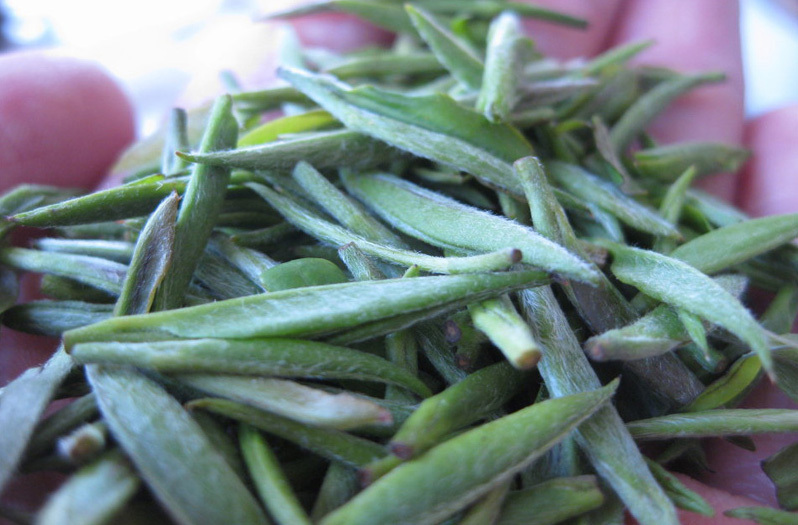 These are properly fried tea leaves. 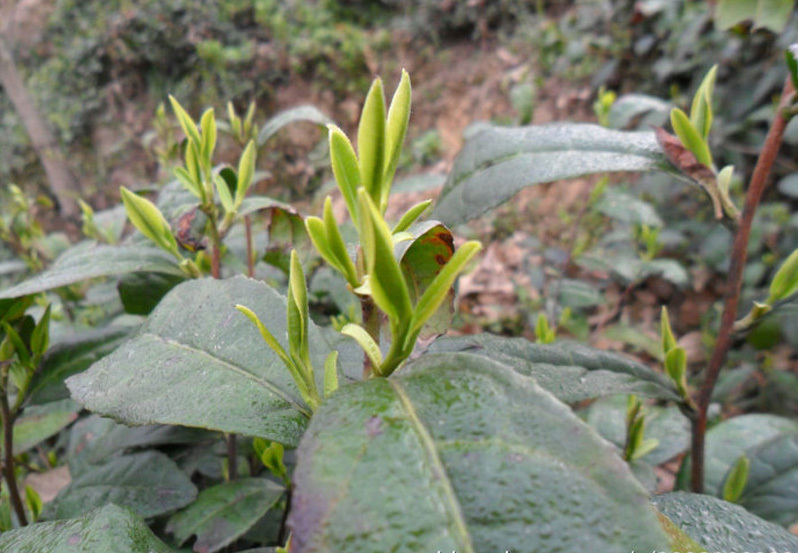 white pekoe already appeared. 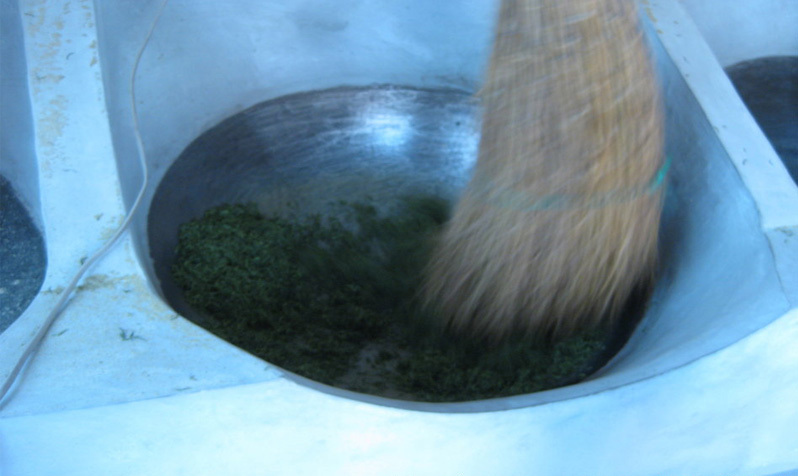 Bamboo brush frying in the pan, in this processing the tea lump and block formed in rolling was dismissed and also tea got further fried. 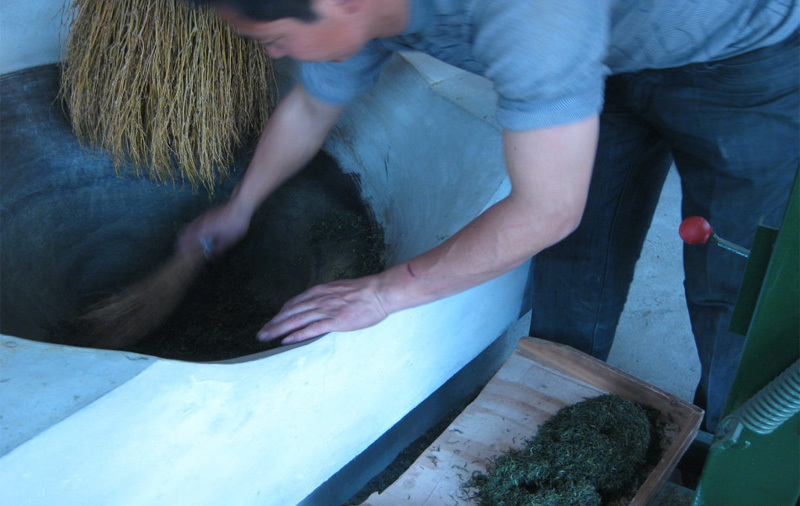 The Bamboo brush also plays the role of shapng the stright tea body of Xin Yang Mao Jian. 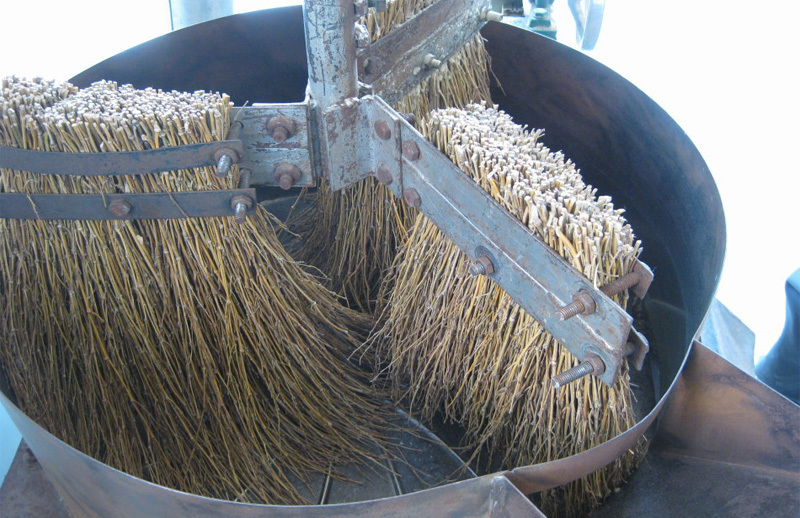 The tea need undergo one other bamboo sweeper handling. 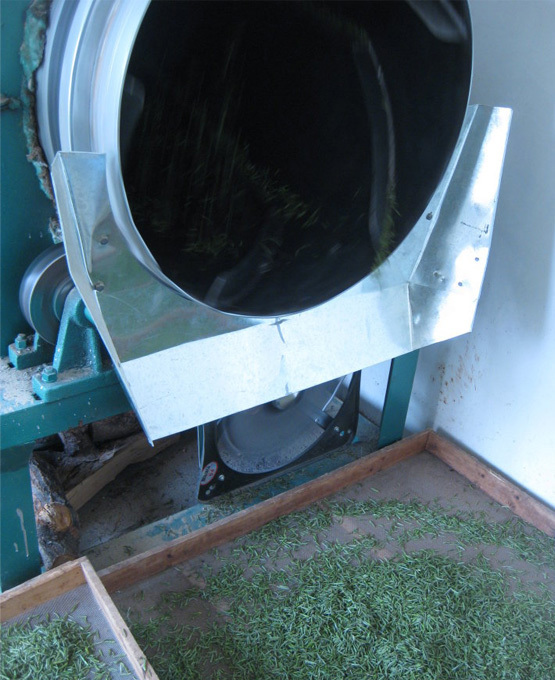 In this processing the leaves shape were re-organized. 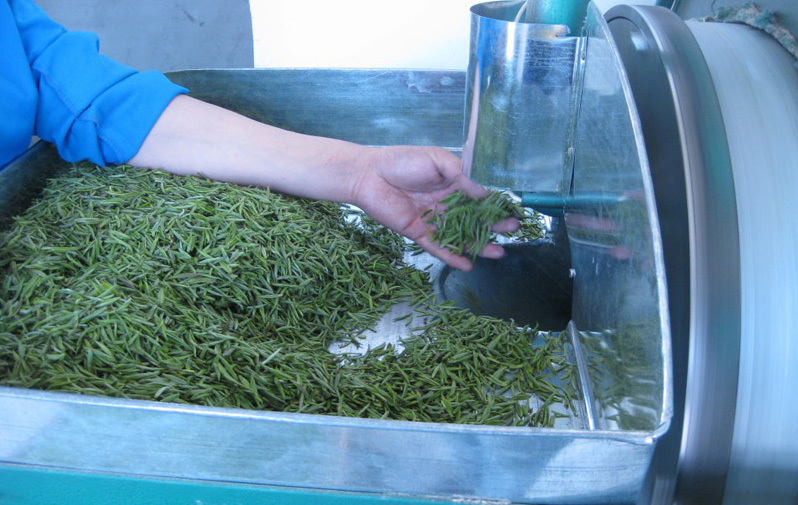 it makes the round slim straight body shape of Xin Yang Mao Jian. Hand-frying in the pan. 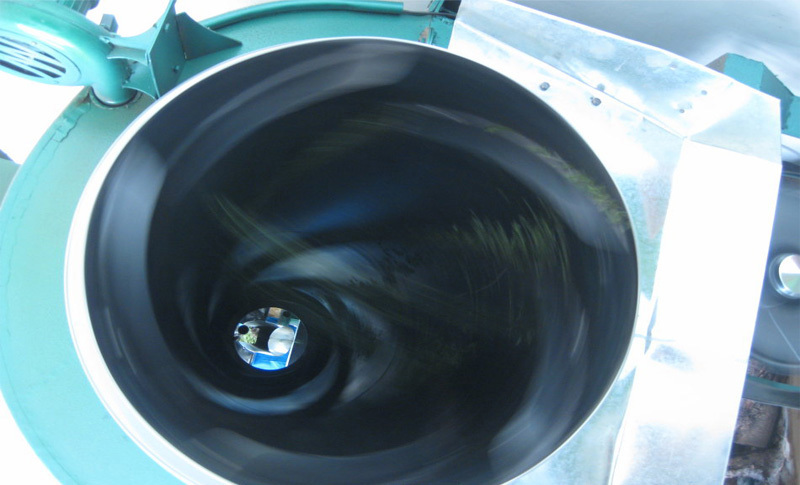 in this processing the water content in the leaves were further lowered. 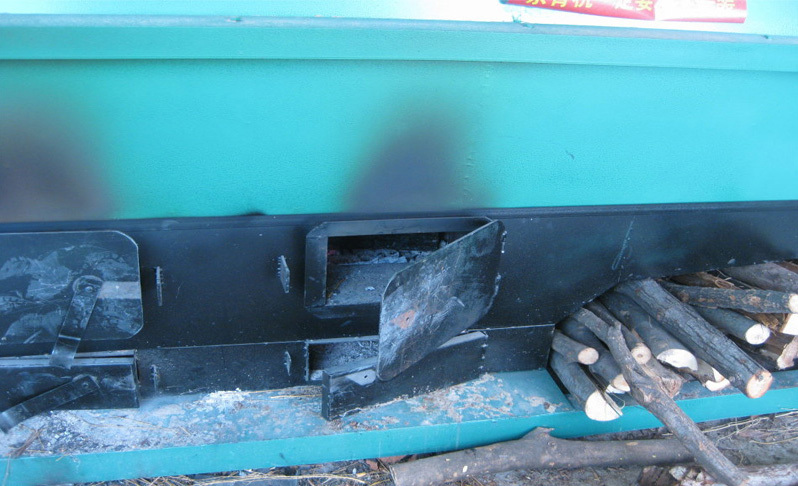 and the tea body shape were fixed in the end. Baking in the bamboo basket by charcoal heat. 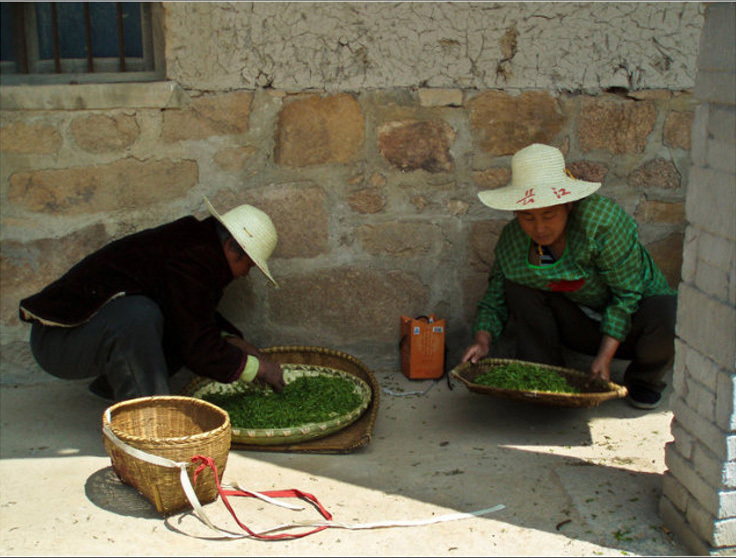 As Chinese experienced, natural heating always produce better food than electric heating. 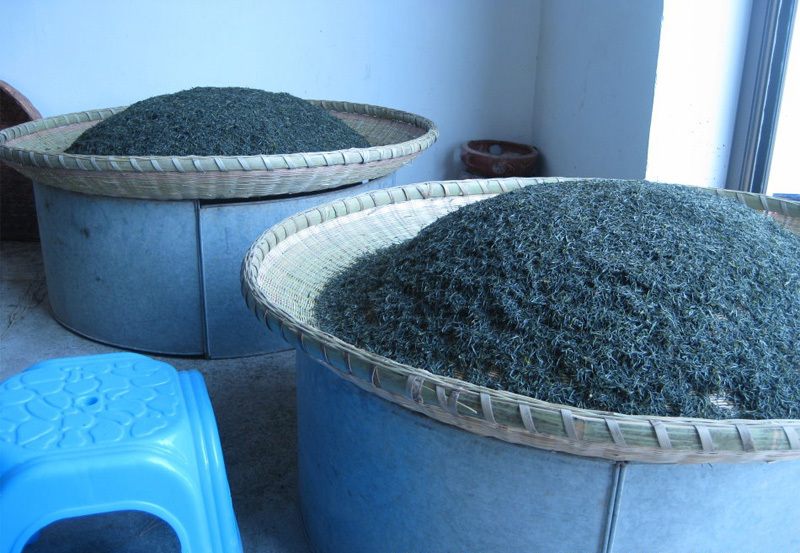 Traditional Xin Yang Mao Jian requires two times of charcoal baking, chuhong （初烘）and zuhong （足烘). 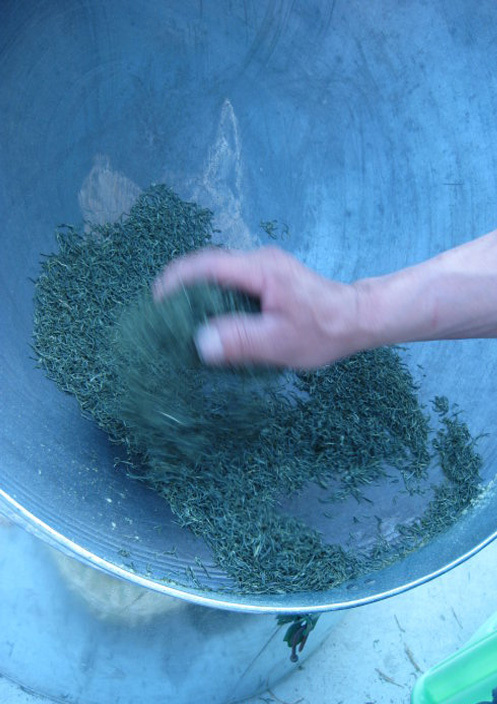 During the baking, we need stir the tea frequently. 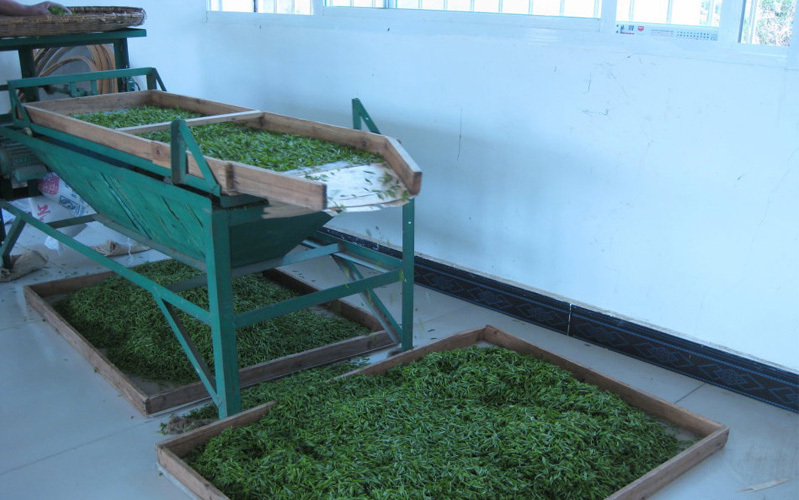 and in between the two times baking, it need put aside for around one hour to evenly re-distribute the water content in the whole tea leaf. Which can finally helps obtain better baking effect. Quality control. Check the baking effect. 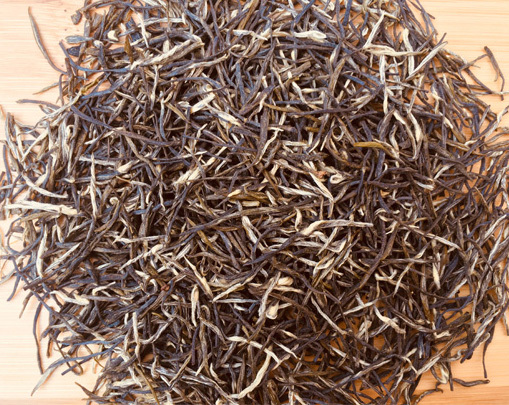 After baking, the tea gives off pleasant tender sweet flavor. 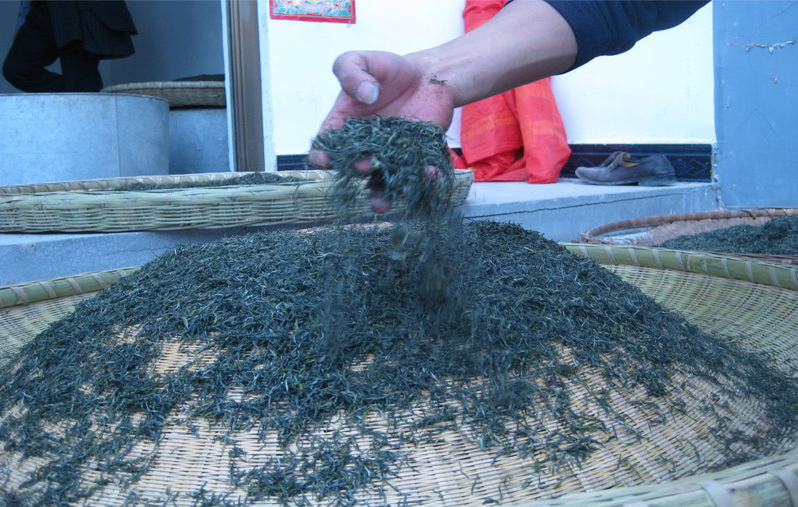 And the exquisite round, slim, straight and white pekoe covering tea body of Xin Yang Mao Jian shows off. 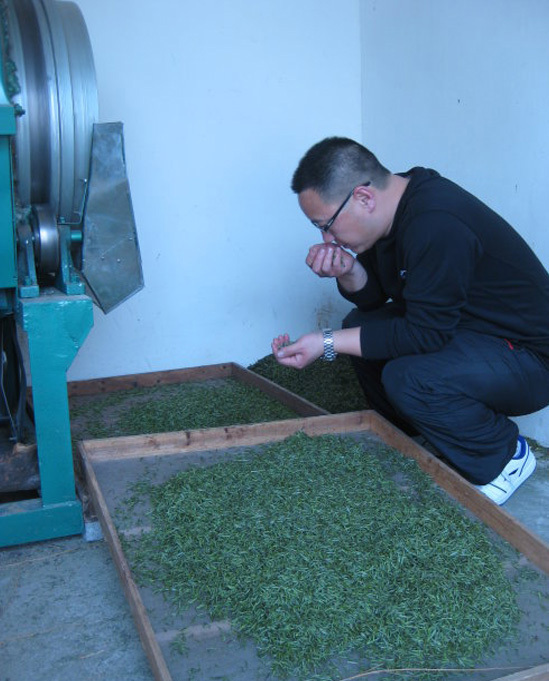 This is the Xin Yang Mao Jian product.